Adam Lee, proprietor and winemaker of Siduri Wines (www.siduri.com), travels the states of California and Oregon sourcing grapes from multiple wine regions for his excellent appellation-designated and vineyarddesignated Pinot Noirs. I don’t know of another Pinot Noir winemaker who tackles such a formidable task, so I look to him when I want an overall view of a vintage. When I spoke with Adam on October 8, harvest was winding down. Well-known vineyard manager, Andy Humphrey, provided the following correspondence to his clients on October 7. • “Even the oldest guy I could find who has been doing this since 1969 has never seen Drosophila in the fruit like this. There are a couple of even older guys, but they probably don’t remember. • Fruit flies are appearing everywhere regardless of AVA, soil, clone and elevation. • The fruit flies seem to not be interested in white varieties - so far. • Although you can find them in berries that were split, they seem to be targeting very tight clusters that had berries off or partially pushed from the stem from previous heavy rains and berry swelling. Almost like those individual berries or groups of berries were “picked,” and continued to sit there in the middle of the cluster in warm weather waiting to become food for Drosophila larvae. • There is a reason they are called vinegar flies. They carry the yeast around with them, the berries they lay their eggs in are inoculated and begin to ferment with the WRONG yeast. Probably a symbiotic relationship between the yeast and the conditions for the larvae to thrive? The result for us, however, is what everyone calls “Sour Rot.” I don’t know if that is scientifically accurate, but it makes sense in my world. • There are low PHI contact sprays that will kill the adults but not the larvae or eggs. • The eggs can hatch into larvae in 15 to 24 hours. • There are long PHI sprays that will kill larvae and eggs, but they infuse the fruit with the residual pesticide. I don’t know of anyone yet who wants to do that or has actually done that. • The conclusion is that you can’t kill them unless you can see them. If you can see them, they have already laid eggs for at least one cycle. If you kill the adults, there is already a new batch on the way. 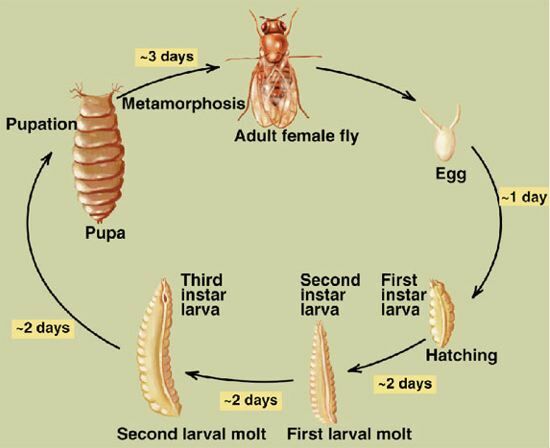 At some point, depending on various conditions, the larvae molting into adults begins to occur one week after the first cycle of eggs are laid. And then? Again every 15-24 hours.